Not to be confused with Commonwealth of Nations. The Commonwealth of Independent States (CIS) is a regional intergovernmental organization of 10 post-Soviet republics in Eurasia formed following the dissolution of the Soviet Union. It has an area of 20,368,759 km² (8,097,484 sq mi) and has an estimated population of 239,796,010. The CIS encourages cooperation in economical, political and military affairs and has certain powers to coordinate trade, finance, lawmaking and security. It has also promoted cooperation on cross-border crime prevention. The CIS has its origins in the Soviet Union (USSR), which replaced the old Russian Empire in 1917 when it was established by the 1922 Treaty and Declaration of the Creation of the USSR by the Russian SFSR, Byelorussian SSR and Ukrainian SSR. When the USSR began to fall in 1991, the founding republics signed the Belavezha Accords on 8 December 1991, declaring the Soviet Union would cease to exist and proclaimed the CIS in its place. A few days later the Alma-Ata Protocol was signed, which declared that Soviet Union was dissolved and that the Russian Federation was to be its successor state. The Baltic states (Estonia, Latvia and Lithuania), which regard their membership in the Soviet Union as an illegal occupation, chose not to participate. Georgia withdrew its membership in 2008. Ukraine, which participated as an associate member, ended its participation in CIS statutory bodies on 19 May 2018. Eight of the nine CIS member states participate in the CIS Free Trade Area. Three organizations are under the overview of the CIS, namely the Collective Security Treaty Organization, the Eurasian Economic Union (alongside subdivisions, the Eurasian Customs Union and the Eurasian Economic Space, which comprises territory inhabited by over 180 million people); and the Union State. While the first and the second are military and economic alliances, the third aims to reach a supranational union of Russia and Belarus with a common government, flag, currency and so on. In March 1991, Mikhail Gorbachev, the president of the Soviet Union, proposed a federation by holding a referendum to preserve the Union as the Union of Sovereign States. The new treaty signing never happened as the Communist Party hardliners staged an attempted coup in August that year. Following the events of August's failed coup, the republics[which?] had declared their independence fearing another coup. A week after the Ukrainian independence referendum was held, which kept the chances of the Soviet Union staying together low, the Commonwealth of Independent States was founded in its place on 8 December 1991 by the Byelorussian SSR, the Russian SFSR, and the Ukrainian SSR, when the leaders of the three republics met at the Belovezhskaya Pushcha Natural Reserve, about 50 km (31 mi) north of Brest in Belarus, and signed the "Agreement Establishing the Commonwealth of Independent States", known as the Creation Agreement (Russian: Соглашение, translit. Soglasheniye). The CIS announced that the new organization would be open to all republics of the former Soviet Union, and to other nations sharing the same goals. The CIS charter stated that all the members were sovereign and independent nations and thereby effectively abolished the Soviet Union. On 21 December 1991, the leaders of eight additional former Soviet Republics (Armenia, Azerbaijan, Kazakhstan, Kyrgyzstan, Moldova, Turkmenistan, Tajikistan and Uzbekistan) signed the Alma-Ata Protocol which can either be interpreted as expanding the CIS to these states or the proper foundation or refoundation date of the CIS, thus bringing the number of participating countries to 11. Georgia joined two years later, in December 1993. At this point, 12 of the 15 former Soviet Republics participated in the CIS. The three Baltic states did not, reflecting their governments' and people's view that the post-1940 Soviet occupation of their territory was illegitimate (in 2004 they joined NATO and the European Union). The CIS and Soviet Union also legally co-existed briefly with each other until 26 December 1991, when Soviet President Gorbachev stepped down, officially dissolving the Soviet Union. This was followed by Ivan Korotchenya becoming Executive Secretary of the CIS on the same day. On 22 January 1993, the Charter (Statutes) of the CIS were signed, setting up the different institutions of the CIS, their functions, the rules and statutes of the CIS. 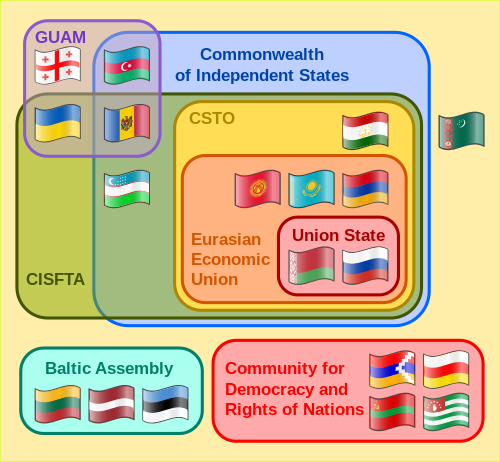 The Charter also defined that all countries having ratified the Agreement on the Establishment of the CIS and its relevant (Alma-Ata) Protocol would be considered to be founding states of the CIS, as well as that only countries ratifying the Charter would be considered to be member states of the CIS (art. 7). Other states can participate as associate members or observers, if accepted as such by a decision of the Council of Heads of State to the CIS (art. 8). All the founding states, apart from Ukraine and Turkmenistan, ratified the Charter of the CIS and became member states of it. Nevertheless, Ukraine and Turkmenistan kept participating in the CIS, without being member states of it. Ukraine became an associate member of the CIS Economic Union in April 1994, and Turkmenistan became an associate member of the CIS in August 2005. Georgia left the CIS altogether in 2009 and Ukraine stopped participating in 2018. During a speech at Moscow State University in 1994, the President of Kazakhstan, Nursultan Nazarbayev, suggested the idea of creating a "common defense" space within the CIS Nazarbayev idea was quickly seen as a way to bolster trade, boost investments in the region, and serve as a counterweight to the West and East Asia. Between 2003 and 2005, three CIS member states experienced a change of government in a series of colour revolutions: Eduard Shevardnadze was overthrown in Georgia; Viktor Yushchenko was elected in Ukraine; and Askar Akayev was toppled in Kyrgyzstan. In February 2006, Georgia withdrew from the Council of Defense Ministers, with the statement that "Georgia has taken a course to join NATO and it cannot be part of two military structures simultaneously", but it remained a full member of the CIS until August 2009, one year after officially withdrawing in the immediate aftermath of the Russo-Georgian War. In March 2007, Igor Ivanov, the secretary of the Russian Security Council, expressed his doubts concerning the usefulness of the CIS, emphasising that the Eurasian Economic Community was becoming a more competent organisation to unify the largest countries of the CIS. 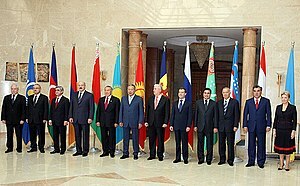 Following the withdrawal of Georgia, the presidents of Uzbekistan, Tajikistan, and Turkmenistan skipped the October 2009 meeting of the CIS, each having their own issues and disagreements with the Russian Federation. The Council of Foreign Ministers met in Dushanbe, Tajikistan on 11 April 2003 to discuss the War in Iraq and consider a draft program for the fight against terrorism and extremism, with the particularly the need for an international role in post-war Iraq, was further addressed at the May summit in St. Petersburg. In May 2009, Armenia, Azerbaijan, Belarus, Georgia, Moldova, and Ukraine joined the Eastern Partnership, a project which was initiated by the European Union (EU). There are nine full member states of the Commonwealth of Independent States. The Creation Agreement remained the main constituent document of the CIS until January 1993, when the CIS Charter (Russian: Устав, Ustav) was adopted. The charter formalised the concept of membership: a member country is defined as a country that ratifies the CIS Charter (sec. 2, art. 7). Parties to CIS Creation Agreement but not the Charter are considered to be "Founding States" but not a full members. Turkmenistan has not ratified the Charter and therefore is not formally a member of the CIS. Nevertheless, it has consistently participated in the CIS as if it were a member state. Turkmenistan changed its CIS standing to associate member as of 26 August 2005 in order to be consistent with its UN-recognised international neutrality status. Following the Russian military intervention in Ukraine and annexation of Crimea, relations between Ukraine and Russia deteriorated, leading Ukraine to consider ending its participation in the CIS. As Ukraine never ratified the Charter, it could cease its informal participation in the CIS. However, to fully terminate its relationship with the CIS it would need to legally withdraw from the Creation Agreement, as Georgia did previously. On 14 March 2014, a bill was introduced to Ukraine's parliament to denounce their ratification of the CIS Creation Agreement, but it was never approved. Following the 2014 parliamentary election, a new bill to denounce the CIS agreement was introduced. In September 2015, the Ukrainian Ministry of Foreign Affairs confirmed Ukraine will continue taking part in the CIS "on a selective basis". Since that month, Ukraine has had no representatives in the CIS Executive Committee building. In April 2018, Ukrainian President Petro Poroshenko indicated that Ukraine would formally leave the CIS. As of 1 June the CIS secretariat had not received formal notice from Ukraine of its withdrawal from the CIS, a process which will take 1 year following notice being given. On 19 May 2018, President Poroshenko signed a decree formally ending Ukraine's participation in CIS statutory bodies. The CIS secretariat stated that it will continue inviting Ukraine to participate. Ukraine has further stated that it intends to review its participation in all CIS agreements, and only continue in those that are in its interests. The CIS secretariat stated that they will keep inviting Ukraine to participate in CIS activities. In light of Russia's support for the independence of breakaway regions within Moldova, Georgia, and Ukraine, as well as its violation of the Istanbul Agreement (see Adapted Conventional Armed Forces in Europe Treaty), legislative initiatives to denounce the agreement on the creation of CIS were tabled in Moldova's parliament on 25 March 2014, though they were not approved. A similar bill was proposed in January 2018. Two states, Ukraine and Turkmenistan, have ratified the CIS Creation Agreement, making them "founding states of the CIS", but did not ratify the subsequent Charter that would make them members of the CIS. These states, while not being formal members of the CIS, were allowed to participate in CIS. They were also allowed to participate in various CIS initiatives, e.g. the Commonwealth of Independent States Free Trade Area, which were, however, formulated mostly as independent multilateral agreements, and not as internal CIS agreements. Additionally, Ukraine became an associate member state of the CIS Economic Union in 1994 and Turkmenistan an associate member state of the CIS in 2005. Turkmenistan 26 December 1991 Not ratified "Founding state". Has never been a member. "Associate state" since 2005. Georgia 3 December 1993 19 April 1994 18 August 2008 18 August 2009 Withdrew as a result of the Russo-Georgian War of 2008. The Interparliamentary Assembly was established in 27 March 1992 in Kazakhstan. On 26 May 1995 CIS leaders signed the Convention on the Interparliamentary Assembly of Member Nations of the Commonwealth of Independent States eventually ratified by nine parliaments. Under the terms of the Convention, the IPA was invested with international legitimacy and is housed in the Tauride Palace in St Petersburg and acts as the consultative parliamentary wing of the CIS created to discuss problems of parliamentary cooperation and reviews draft documents of common interest and passes model laws to the national legislatures in the CIS (as well as recommendations) for their use in the preparation of new laws and amendments to existing legislation too which have been adopted by more than 130 documents that ensure the convergence of laws in the CIS to the national legislation. The Assembly is actively involved in the development of integration processes in the CIS and also sends observers to the national elections. The Assembly held its 32nd Plenary meeting in Saint Petersburg on 14 May 2009. Ukraine participates, but Uzbekistan does not. Since its inception, one of the primary goals of the CIS has been to provide a forum for discussing issues related to the social and economic development of the newly independent states. To achieve this goal member states have agreed to promote and protect human rights. Initially, efforts to achieve this goal consisted merely of statements of good will, but on 26 May 1995, the CIS adopted a Commonwealth of Independent States Convention on Human Rights and Fundamental Freedoms. Even before the 1995 human rights treaty, the Charter of the CIS that was adopted in 1991 created, in article 33, a Human Rights Commission sitting in Minsk, Belarus. This was confirmed by decision of the Council of Heads of States of the CIS in 1993. In 1995, the CIS adopted a human rights treaty that includes civil and political as well as social and economic human rights. This treaty entered into force in 1998. The CIS treaty is modeled on the European Convention on Human Rights, but lacking the strong implementation mechanisms of the latter. In the CIS treaty, the Human Rights Commission has very vaguely defined authority. The Statute of the Human Rights Commission, however, also adopted by the CIS Member States as a decision, gives the Commission the right to receive inter-state as well as individual communications. CIS members, especially in Central Asia, continue to have among the world's poorest human rights records. Many activists point examples such as the 2005 Andijan massacre in Uzbekistan to show that there has been almost no improvement in human rights since the collapse of the Soviet Union in Central Asia. The consolidation of power by President Vladimir Putin has resulted in a steady decline in the modest progress of previous years in Russia. The Commonwealth of Independent States continues to face serious challenges in meeting even basic international standards. The CIS Charter establishes the Council of Ministers of Defense, which is vested with the task of coordinating military cooperation of the CIS member states. To this end, the Council develops conceptual approaches to the questions of military and defense policy of the CIS member states; develops proposals aimed to prevent armed conflicts on the territory of the member states or with their participation; gives expert opinions on draft treaties and agreements related to the questions of defense and military developments; issues related suggestions and proposals to the attention of the CIS Council of the Heads of State. Also important is the Council's work on approximation of the legal acts in the area of defense and military development. An important manifestation of integration processes in the area of military and defense collaboration of the CIS member states is the creation, in 1995, of the joint CIS Air Defense System. Over the years, the military personnel of the joint CIS Air Defense System grew twofold along the western, European border of the CIS, and by 1.5 times on its southern borders. When Boris Yeltsin became Russian Defence Minister on 7 May 1992, Yevgeny Shaposhnikov, was appointed as Commander-in-Chief of the CIS Armed Forces, and his staff were ejected from the MOD and General Staff buildings and given offices in the former Warsaw Pact Headquarters at 41 Leningradsky Prospekt on the northern outskirts of Moscow. Shaposhnikov resigned in June 1993. In December 1993, the CIS Armed Forces Headquarters was abolished. Instead, "the CIS Council of Defence Ministers created a CIS Military Cooperation Coordination Headquarters (MCCH) in Moscow, with 50 per cent of the funding provided by Russia." General Viktor Samsonov was appointed as Chief of Staff. The headquarters has now moved to 101000, Москва, Сверчков переулок, 3/2, and 41 Leningradsky Prospekt has now been taken over by another Russian MOD agency. The chiefs of the CIS general staffs have spoken in favor of integrating their national armed forces. The CIS is known to have mediated some regional hostilities between the "Stan countries" in Central Asia. In 1994, negotiations were initiated between the CIS countries on free trade area (FTA), but no agreement was signed. A proposed free trade agreement would have covered all twelve then CIS members except Turkmenistan. In 2009, a new agreement was begun to create a FTA, the CIS Free Trade Agreement (CISFTA). In October 2011, the new free trade agreement was signed by eight of the eleven CIS prime ministers; Armenia, Belarus, Kazakhstan, Kyrgyzstan, Moldova, Russia, Tajikistan, and Ukraine at a meeting in St. Petersburg. Initially, the treaty was only ratified by Russia, Belarus, and Ukraine, however by the end of 2012, Kazakhstan, Armenia, and Moldova had also completed ratification. In December 2013, Uzbekistan, signed and then ratified the treaty, while the remaining two signatories, Kyrgyzstan and Tajikistan later both ratified the treaty in January 2014 and December 2015 respectively. Azerbaijan is the only full CIS member state not to participate in the free trade area. The free trade agreement eliminates export and import duties on a number of goods but also contains a number of exemptions that will ultimately be phased out. An agreement was also signed on the basic principles of currency regulation and currency controls in the CIS at the same October 2011 meeting. Corruption and bureaucracy are serious problems for trade in CIS countries. Kazakhstan's President Nursultan Nazarbayev proposed that CIS members take up a digitization agenda to modernize CIS economies. After discussion about the creation of a common economic space between the Commonwealth of Independent States (CIS) countries of Russia, Ukraine, Belarus, and Kazakhstan, agreement in principle about the creation of this space was announced after a meeting in the Moscow suburb of Novo-Ogarevo on 23 February 2003. The Common Economic Space would involve a supranational commission on trade and tariffs that would be based in Kiev, would initially be headed by a representative of Kazakhstan, and would not be subordinate to the governments of the four nations. The ultimate goal would be a regional organisation that would be open for other countries to join as well, and could eventually lead even to a single currency. On 22 May 2003, the Verkhovna Rada (the Ukrainian Parliament) voted 266 votes in favour and 51 against the joint economic space. However, most believe that Viktor Yushchenko's victory in the Ukrainian presidential election of 2004 was a significant blow against the project: Yushchenko has shown renewed interest in Ukrainian membership in the European Union and such membership would be incompatible with the envisioned common economic space. Yushchenko's successor Viktor Yanukovych stated on 27 April 2010 "Ukraine's entry into the Customs Union of Russia, Belarus and Kazakhstan is not possible today, since the economic principles and the laws of the WTO do not allow it, we develop our policy in accordance with WTO principles". Ukraine is a WTO member. A Customs Union of Belarus, Kazakhstan and Russia was thus created in 2010, with a single market envisioned for 2012. The data is taken from the United Nations statistics division and the United States Central Intelligence Agency. Kazakhstan, Kyrgyzstan, Tajikistan, Turkmenistan and Uzbekistan formed the OCAC in 1991 as Central Asian Commonwealth (CAC). The organisation continued in 1994 as the Central Asian Economic Union (CAEU), in which Tajikistan and Turkmenistan did not participate. In 1998 it became the Central Asian Economic Cooperation (CAEC), which marked the return of Tajikistan. On 28 February 2002 it was renamed to its current name. Russia joined on 28 May 2004. On 7 October 2005 it was decided between the member states that Uzbekistan will join the Eurasian Economic Community and that the organisations will merge. The organisations joined on 25 January 2006. It is not clear what will happen to the status of current CACO observers that are not observers to EurAsEC (Georgia and Turkey). The post-Soviet disputed states of Abkhazia, Artsakh, South Ossetia, and Transnistria are all members of the Community for Democracy and Rights of Nations which aims to forge closer integration among the members. The CIS-Election Monitoring Organisation (Russian: Миссия наблюдателей от СНГ на выборах) is an election monitoring body that was formed in October 2002, following a Commonwealth of Independent States heads of states meeting which adopted the Convention on the Standards of Democratic Elections, Electoral Rights, and Freedoms in the Member States of the Commonwealth of Independent States. The CIS-EMO has been sending election observers to member countries of the CIS since this time; they approved many elections which have been heavily criticised by independent observers. The democratic nature of the final round of the Ukrainian presidential election, 2004 which followed the Orange Revolution and brought into power the former opposition, was questioned by the CIS while the Organisation for Security and Co-operation in Europe (OSCE) found no significant problems. This was the first time ever that the CIS observation teams challenged the validity of an election, saying that it should be considered illegitimate. On 15 March 2005, the Ukrainian Independent Information Agency quoted Dmytro Svystkov (a spokesman of the Ukrainian Foreign Ministry) that Ukraine has suspended its participation in the CIS election monitoring organisation. The CIS praised the Uzbekistan parliamentary elections, 2005 as "legitimate, free and transparent" while the OSCE had referred to the Uzbek elections as having fallen "significantly short of OSCE commitments and other international standards for democratic elections". Moldovan authorities refused to invite CIS observers in the Moldovan parliamentary elections, 2005, an action Russia criticised. Many dozens such observers from Belarus and Russia were stopped from reaching Moldova. CIS observers monitored the Tajikistan parliamentary elections, 2005 and in the end declared them "legal, free and transparent." The same elections were pronounced by the OSCE to have failed international standards for democratic elections. Soon after CIS observers hailed the Kyrgyz parliamentary elections of 2005 as "well-organised, free, and fair", as large-scale and often violent demonstrations broke out throughout the country protesting what the opposition called a rigged parliamentary election. In contrast the OSCE reported that the elections fell short of international standards in many areas. International observers of the Interparliamentary Assembly stated the 2010 local elections in Ukraine were organised well. While the Council of Europe uncovered a number of problems in relation to a new electorate law approved just prior to the elections and the Obama administration criticised the conduct of the elections, saying they "did not meet standards for openness and fairness". Russia has been urging that the Russian language receive official status in all of the CIS member states. So far Russian is an official language in only four of these states: Russia, Belarus, Kazakhstan, and Kyrgyzstan. Russian is also considered an official language in the region of Transnistria, and the autonomous region of Gagauzia in Moldova. Viktor Yanukovych, the Moscow-supported presidential candidate in the controversial 2004 Ukrainian presidential election, declared his intention to make Russian an official second language of Ukraine. However, the Western-supported candidate Viktor Yushchenko, the winner, did not do so. After his early 2010 election as President Yanukovych stated (on 9 March 2010) that "Ukraine will continue to promote the Ukrainian language as its only state language". At the time of the Soviet Union's dissolution in December 1991, its sports teams had been invited to or qualified for various 1992 sports events. A joint CIS team took its place in some of these. The "Unified Team" competed in the 1992 Winter Olympics and 1992 Summer Olympics, and a CIS association football team competed in UEFA Euro 1992. A CIS bandy team played some friendlies in January 1992 and made its last appearance at the 1992 Russian Government Cup, where it also played against the new Russia national bandy team. The Soviet Union bandy championship for 1991–1992 was rebranded as a CIS championship. Since then, CIS members have each competed separately in international sport. In 2017 a festival for national sports and games, Фестиваль национальных видов спорта и игр государств — участников Содружества Независимых Государств, was held in Ulyanovsk. The main sports were sambo, tug of war, mas-wrestling, gorodki, belt wrestling, lapta, bandy (rink), kettlebell lifting, chess and archery. A few demonstration sports were also a part of the programme. ^ "Commonwealth of Independent States - Ministry of Foreign Affairs of the Republic of Belarus". mfa.gov.by. ^ Corresponds to the terrestrial surface. Including the Exclusive Economic Zones of each member state, the total area is 28 509 317 km². ^ a b "Poroshenko signs decree on final termination of Ukraine's participation in CIS statutory bodies". Retrieved 19 May 2018. ^ "Russia Economic Conditions in Mid-1996". Library of Congress. Retrieved 7 July 2014. ^ a b Vladimir, Radyuhin. "Three-nation Eurasian union set up as bridge". The Hindu. Retrieved 7 July 2014. ^ "Russia, Belarus, Kazakhstan sign 'epoch' Eurasian Economic Union". Russia Today. Retrieved 7 July 2014. ^ "Kazakhstan welcomes Putin's Eurasian Union concept". The Daily Telegraph. 6 October 2011. Retrieved 8 October 2011. ^ "Eurasian Economic Union to become a bridge between Europe and Pacific Rim". Vestnik Kavkaza. Retrieved 7 July 2014. ^ 3 February 2006 (11 September 2001). "Georgia opts out of ex-Soviet military cooperation body". Pravda.Ru. Retrieved 23 July 2013. ^ "RIA Novosti – World – Georgia's quitting CIS council will not affect security – Russian minister". En.rian.ru. Retrieved 23 July 2013. ^ Pannier, Bruce. "Russia Facing Resistance With Allies On CIS's Southern Flank". Rferl.org. Retrieved 23 July 2013. ^ "Commonwealth of Independent States (CIS) - Treaties & Regimes - NTI". www.nti.org. ^ Decision on Turkmenistan's associate membership[permanent dead link], CIS Executive Committee meeting in Kazan, Russia, 26 August 2005 (in Russian). ^ Conflict in the Former USSR. Retrieved 25 September 2014. ^ Russia and Nis Mineral Industry Handbook. Retrieved 25 September 2014. ^ September 2008 Statement by Foreign Minister of Ukraine Volodymyr Ohryzko, "Ukraine does not recognise the legal personality of this organisation, we are not members of the CIS Economic Court, we did not ratify the CIS Statute, thus, we cannot be considered a member of this organisation from international legal point of view. Ukraine is a country-participant, but not a member country"
^ Economic Interdependence in Ukrainian-Russian Relations. Retrieved 25 September 2014. ^ "Bill introduced to withdraw Ukraine from CIS". Kyiv Post. 15 March 2014. Retrieved 27 March 2014. ^ "Результати пошуку законопроектiв, зареєстрованих Верховною Радою України". Retrieved 25 September 2014. ^ "Draft documents on Ukraine's withdrawal from CIS submitted to Verkhovna Rada". Information Telegraph Agency of Russia. 27 May 2014. Retrieved 21 June 2014. ^ "Проект Постанови про припинення членства та участі України в органах Співдружності Незалежних Держав". Verkhovna Rada. Retrieved 30 November 2014. ^ "Проект Закону про зупинення дії Угоди про створення Співдружності Незалежних Держав". Verkhovna Rada. Retrieved 26 December 2014. ^ "Ukraine to officially quit CIS – Poroshenko". UNIAN. Retrieved 12 April 2018. ^ "CIS Executive Secretary hopes Ukraine will remain member nation of the CIS". 1 June 2018. Retrieved 21 July 2018. ^ "Kyrgyz envoy: CIS to consider Ukraine's withdrawal as soon as Kyiv files official application". Interfax-Ukraine. 2 June 2018. Retrieved 21 July 2018. ^ "CIS to continue sending meeting invitations to Ukraine". 23 May 2018. Retrieved 21 July 2018. ^ "Ukraine's withdrawal from CIS to not bring it closer to EU, - Russia". 22 May 2018. Retrieved 21 July 2018. ^ "Executive Committee Chairman: CIS states interested in keeping Ukraine as member". 11 October 2018. Retrieved 8 December 2018. ^ "Ukraine to not denounce agreements on transit, employment within CIS". 16 April 2018. Retrieved 21 July 2018. ^ "Ukraine to reconsider all international agreements with CIS, - Poroshenko". 21 May 2018. Retrieved 21 July 2018. ^ Buckley, Neil (25 November 2014). "Georgia calls on west to condemn Abkhazia treaty with Russia". Financial Times. Retrieved 9 May 2015. ^ Rettman, Andrew (7 May 2015). "Donbas: A new 'black hole' in Europe". Retrieved 9 May 2015. ^ "Russia Erecting Monument to 'Little Green Men' Who Took Over Crimea". Moscow Times. 26 April 2015. Retrieved 9 May 2015. ^ "Proiectul hotărîrii cu privire la denunțarea Acordului de constituire a Comunității Statelor Independente". Parliament of the Republic of Moldova. Retrieved 4 November 2014. ^ "Proiectul legii cu privire la denunțarea Acordului de constituire a Comunității Statelor Independente nr.40-XII din 08.04.1994". Parliament of the Republic of Moldova. Retrieved 4 November 2014. ^ "Proiectul hotărîrii cu privire la denunțarea Acordului de constituire a Comunității Statelor Independente". Parliament of the Republic of Moldova. 2 January 2018. Retrieved 29 January 2018. ^ "Moldova Says It Would Leave CIS Only After Becoming EU Candidate". Radio Free Europe/Radio Liberty. 25 January 2018. Retrieved 29 January 2018. ^ a b "Сведения о ратификации документов, принятых в рамках СНГ в 1991 – 2014 годах". Commonwealth of Independent States. Retrieved 10 October 2014. ^ "Ukraine's withdrawal from CIS to take one year - Vestnik Kavkaza". vestnikkavkaza.net. ^ "FREE TRADE AGREEMENT BETWEEN AZERBAIJAN, ARMENIA, BELARUS, GEORGIA, MOLDOVA, KAZAKHSTAN, THE RUSSIAN FEDERATION, UKRAINE, UZBEKISTAN, TAJIKISTAN AND THE KYRGYZ REPUBLIC" (PDF). Retrieved 21 July 2018. ^ Ponomarenko, Illia (19 May 2018). "Ukraine withdraws all envoys from CIS bodies". Kyiv Post. Archived from the original on 20 May 2018. Retrieved 20 May 2018. ^ Information and Publish. Department. "CIS Inter-Parliamentary Assembly". Cisstat.com. Retrieved 23 July 2013. ^ "Member Nations of the CIS". CIS Interparliamentary Assembly. Retrieved 14 March 2015. ^ "Commonwealth of Independent States Convention on Human Rights and Fundamental Freedoms". 1995. Retrieved 24 March 2013. ^ "Информация о Совете министров обороны государств – участников Содружества Независимых Государств". Cis.minsk.by. Retrieved 23 July 2013. ^ "CIS chiefs of staff want military integration." RIA Novosti, 3 December 2010. ^ "Free Trade Agreement Between Azerbaijan, Armenia, Belarus, Georgia, Moldova, Kazakhstan, The Russian Federation, Ukraine, Uzbekistan, Tajikistan And The Kyrgyz Republic" (PDF). Archived from the original (PDF) on 17 May 2016. Retrieved 23 July 2013. ^ Russia’s Duma ratifies Eurasian Economic Union, odessatalk.com. Retrieved 22 June 2018. ^ CIS Free Trade Agreement comes into force; Baker & McKenzi, Kyiv, Ukraine, Thursday, 18 October 2012, Retrieved 22 June 2018. ^ Usbekistan: Protokoll über Beitritt zur GUS-Freihandelszone in Kraft getreten, de.ria.ru 28 December 2013. Retrieved 22 June 2018. ^ Uzbekistan joins CIS free trade zone, azernews.az. Retrieved 22 June 2018. ^ "Petro Jacyk Program – Centre for Russian and East European Studies, University of Toronto" (PDF). Archived from the original (PDF) on 11 December 2013. Retrieved 25 September 2014. ^ "Nazarbayev proposes CIS modernisation, meets EUAU counterparts in Sochi". Astana Calling. ^ "Russia, Kazakhstan, Belarus plan on common economic space". Rbcnews.com. Retrieved 23 July 2013. ^ "Russia expects CIS countries to create free trade area". En.rian.ru. Retrieved 23 July 2013. ^ "Central Asian Cooperation Organisation". Retrieved 23 July 2013. ^ "Working group discusses Uzbekistan's accession to EurAsEC". En.rian.ru. Archived from the original on 1 May 2013. Retrieved 23 July 2013. ^ "Collective Security: A Timeline". Centralasia.foreignpolicyblogs.com. Archived from the original on 10 May 2011. Retrieved 23 July 2013. ^ "Election fraud: How to steal an election". The Economist. 3 March 2012. Retrieved 19 May 2012. ^ "CIS Observers Outraged by Deportation of Colleagues". azi.md. ^ Kupchinsky, Roman. "CIS: Monitoring The Election Monitors". Rferl.org. Retrieved 23 July 2013. ^ "Виды спорта - I Фестиваль национальных видов спорта и игр государств – участников СНГ - Ульяновск 2017". sportuln.ru. ^ Vinep A Kankam-da-Costa (2012). Who Is Fit to Rule America in the Twenty-First Century and Beyond?. Xlibris. p. 271. ISBN 9781479739653. Retrieved 17 November 2013. ^ "Russian Federation" (PDF). Organisation for Economic Co-operation and Development (OECD). Retrieved 7 July 2014. ^ "Eurasian economic integration: figures and facts" (PDF). Retrieved 7 July 2014. Wikivoyage has a travel guide for Commonwealth of Independent States. Wikimedia Commons has media related to Commonwealth of Independent States. Kembayev, Zhenis. Legal Aspects of the Regional Integration Processes in the Post-Soviet Area. Berlin-Heidelberg: Springer Verlag, 2009 (summary and sample pages).